Chicago, Illinois - Insurgent teachers from West Virginia, Arizona, and Kentucky discussed their experiences at the biannual Labor Notes conference. Three thousand rank and file union activists from across the United States and beyond gathered at the conference to discuss how to revitalize the labor movement. 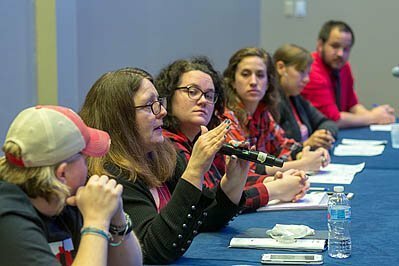 Image Description: Chicago, Illinois - Insurgent teachers from West Virginia, Arizona, and Kentucky discussed their experiences at the biannual Labor Notes conference. Three thousand rank and file union activists from across the United States and beyond gathered at the conference to discuss how to revitalize the labor movement.